Grab bars are great for people with mobility problem and anybody who needs the extra bracing support! 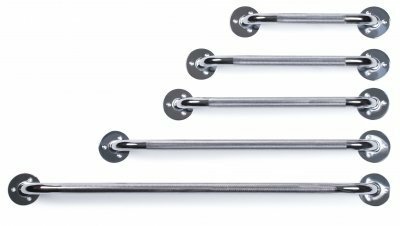 This knurl bar can support up to 250 pounds (evenly distributed) and features heavy duty steel construction with rust resistant finishes. It mounts vertically, horizontally or diagonally 1 ½" from wall and is designed to meet the requirements of HCPCS code: E0241. Backed by a limited lifetime warranty! Durable chrome plated steel 32 inch grab bar. knurling creates a good gripping surface. mounts vertically, horizontally or diagonally 1 1/2 inch from wall. 250 lb maximum weight capacity. • Durable chrome plated steel blends attractively into any décor.• Knurling provides a good gripping surface.• Mounts vertically, horizontally or diagonally 1 ½"; from wall.• 250 lb maximum weight capacity.• Designed to meet the requirements of HCPCS code: E0241.• Lifetime limited warranty. Chrome Grab Bars: 24"/CS Durable chrome plated steel blends attractively into any decor. Durable chrome plated steel blends attractively into any decor. Knurling provides a good gripping surface. Mounts vertically, horizontally or diagonally 1 and one half" from wall. Attractive retail packaging. 250 lb maximum weight capacity. Designed to meet the requirements of HCPCS code: E0241. Lifetime limited warranty.Product photo may not exactly match the product offered for sale. Please refer to the product description. Versa-Helper Trapeze: Chrome-plated, assisted weight capacity 250 lbs. 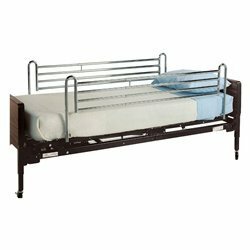 Helps patient safely change position in bed and transfer from bed to other equipment with minimal assistance. • Helps patient safely change position in bed and transfer from bed to other equipment with minimal assistance.• Rubber bumper guards protect walls.• Handbar location fully adjustable.• Height adjustable from 43" to 52".• VersaGuard-coated clamps and handbar.• For use with metal frame headboards only.• Assisted weight capacity of 250 lbs.• Designed to meet the requirements of HCPCS code: E0910.Product photo may not exactly match the product offered for sale. Please refer to the product description. Mounts to fabric spring of bed utilizing two spring-loaded cross bars. Telescoping, chrome-plated steel rails with chrome finish cross bars. Tool-free installation. Three year limited warranty. Can be used with Universal and WhisperLiteTM II Homecare Beds. Not recommended for institutional use. Designed to meet the requirements of HCPCS code: E0310Length; Extends from 46" - 72"Height: 20"
Chrome Grab Bars: 32"/CS Durable chrome plated steel blends attractively into any decor. Durable chrome plated steel blends attractively into any decor. Knurling provides a good gripping surface. Mounts vertically, horizontally or diagonally 1 and one half" from wall. Attractive retail packaging. 250 lb maximum weight capacity. Designed to meet the requirements of HCPCS code: E0241. Lifetime limited warranty.Product photo may not exactly match the product offered for sale. Please refer to the product description. Chrome Grab Bars: 18"/CS Durable chrome plated steel blends attractively into any decor. Durable chrome plated steel blends attractively into any decor. Knurling provides a good gripping surface. Mounts vertically, horizontally or diagonally 1 and one half" from wall. Attractive retail packaging. 250 lb maximum weight capacity. Designed to meet the requirements of HCPCS code: E0241. Lifetime limited warranty.Product photo may not exactly match the product offered for sale. Please refer to the product description. 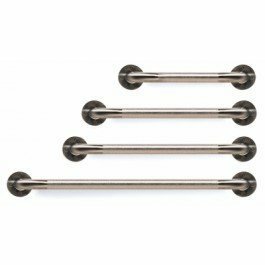 Chrome Grab Bars: Grab Bar 12" Chrome Knurled/CS Durable chrome plated steel blends attractively into any decor. Durable chrome plated steel blends attractively into any decor. Knurling provides a good gripping surface. Mounts vertically, horizontally or diagonally 1 and one half" from wall. Attractive retail packaging. 250 lb maximum weight capacity. Designed to meet the requirements of HCPCS code: E0241. Lifetime limited warranty.Product photo may not exactly match the product offered for sale. Please refer to the product description. Compare prices on Lumex Chrome Grab Bar at LiveSaler.com – use promo codes and coupons for best offers and deals. We work hard to get you amazing deals and collect all avail hot offers online and represent it in one place for the customers. Now our visitors can leverage benefits of big brands and heavy discounts available for that day and for famous brands. We try to makes comparison shopping easy with Product Reviews, Merchant Ratings, Deal Alerts & Coupons. Find Deals, Compare Prices, Read Reviews & Save Money.